The track Erase Me, from the soon-to-be-released reunion album The Sound of the Life of the Mind, is out and available for download from Spin Magazine. The five-minute track picks up musically where the guys left off thirteen years ago, and chronicles the familiar story of love lost. The full album goes on sale September 18. 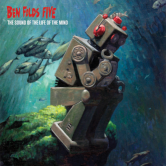 Even though most, if not all, of the songs will be out and about already, the reunited Ben Folds Five’s recently recorded album The Sound of the Life of the Mind will be officially released on September 18 through Ben’s longtime Sony Music affiliation. Taking a leaf from the PledgeMusic campaign making contributors all “vice-presidents of promotion,” the album’s on the “ImaVeePee Records” imprint. In addition to the already-out Do It Anyway, the Folds/Sledge/Jessee collab contains the tracks Erase Me, Michael Praytor Five Years Later, Sky High, The Sound of the Life of the Mind, On Being Frank, Draw a Crowd, Hold That Thought, Away When You Were Here, and Thank You For Breaking My Heart. Fans who donated to the PledgeMusic project will get access to the tracks earlier than the album release date. A short tour of US venues has been announced for September and early October, followed by a few dates in Australia and several in the UK and Ireland; details are on the tour dates page.